Vince Vaughn, Lady Gaga take a dip in icy Lake Michigan for Polar Plunge. Vince Vaughn participates in the Chicago Polar Plunge 2015 at North Avenue Beach on March 1, 2015, in Chicago. 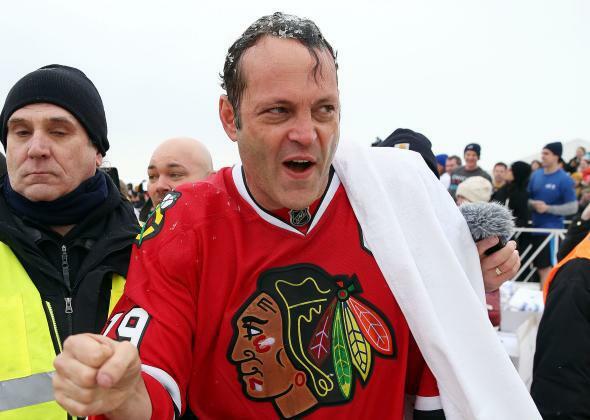 He didn’t do it in a suit, à la Jimmy Fallon last year, but actor Vince Vaughn was the celebrity guest of honor at the 15th annual Polar Plunge in Chicago. And Lady Gaga just showed up for kicks. The annual event raises money for the Special Olympics, and the organization used social media to recruit the actor with the hashtag #VinnyDippin, reports the Chicago Tribune. Lady Gaga made the surprise appearance alongside her fiancé, Chicago Fire actor Taylor Kinney. Lady Gaga entered the water on Kinney’s shoulders, reports NBC, which points out the actor was scheduled to participate with two of his co-stars. More than 4,500 people took part in the plunge, according to the Associated Press.